Jeff and I e-mailed about topics and we decided on faith in fantasy. That’s not exactly a short topic. I’ve decided to look at faith in fantasy world building. It’s still a huge topic. How can I possibly pull this one off? I mean, if Tolkien and Lewis couldn’t agree with one another about faith in a fantasy setting, what do I have to offer here? I just have my experiences as a writer. Several years ago when I slogged through my first novel (a sci-fi novel that’s still not ready for print), I realized that I wanted something more for my characters than the “pull yourself up by your bootstraps” reason to finish the good fight. I wanted to define that inner spark from deep inside them that would give them the strength to survive the hardships and the courage to overcome any obstacles I threw in their path. At the start of The Champion Trilogy, I decided to try something new to me. As I daydreamed and imagined the world of Aramatir, I wondered how I could show faith in the very fabric of the world and in the drive of the main character, Clara. I daydreamed up history, religious practices, governments, and dilemmas. Clara, my MC, struggles to have the faith to finish her journey. In Aramatir, there are only two ways to gain power: faith or blood magic. There is no third option other than to lie down and let events run roughshod over her. In the process of writing the third draft of Champion in the Darkness, I went to a writing workshop at my local library. The teacher had us write the theme of our book in one word. This may seem simple, but I found it extremely challenging at first. Now I recommend it. My one word theme for Champion in the Darkness is faith. My one word theme for Champion in Flight is healing (with a side of hope). My one word theme for Champion’s Destiny is love (and not just romantic love). It all seems overly simple and slightly cheesy, but I find one word themes help keep me on track when I think about having my characters go gallivanting on a side adventure. I was a little embarrassed to share my one word themes at that workshop, and sure enough, a few people at my table physically drew their chairs back and away from me when I said the word, “faith.” I didn’t leap over the table and hit them over the head with a Bible verse. That’s not the purpose of my theme words or any of my writing. Although The Champion Trilogy is fairly explicit about my faith, I think that faith in fantasy world building can be subtle and evocative. I’m just not there yet as a writer. For me to break out of my “chin up and tough it out” attitude for my main characters, I had to explore the possibilities of an open and defined faith in a fantasy setting. What do you think about faith in fantasy world building or faith in fantasy? What motivates the main characters in your writing and in the books you love? 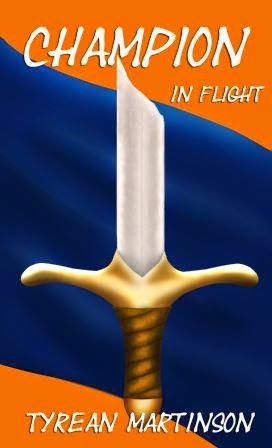 Champion in Flight Find it on Amazon and Smashwords. And I admire that you placed such an emphasis on faith in your work. It can be a tough line to walk. How much is too much? How much do you make up? I don't regret writing mine without faith, but them, my own Christian values are still present in the story. So I hope that was enough. Sum up your books in one word? Friendship, love, family. Thanks, Alex! I think your faith is in your books like Tolkien's faith was in LOTR - it's in the way that the whole fabric of the story is woven together. And great summaries of your books! I think it's a wonderful thing to include faith. My books are contemporary, but they all deal with faith and have strong Christian overtones.